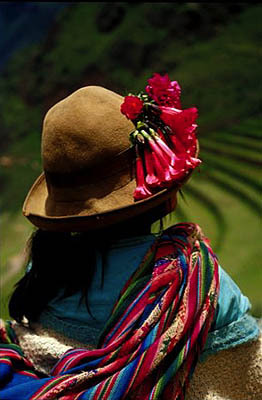 Topics for Peru, Ecuador and Chile include help during your tour, passports and visas, is it safe?, health, flights, baggage, arrival and departure in South America, climate, clothing, money, tipping, spas, hotel amenities, communications, technical standards, textiles and other crafts, music and suggested reading. You also can contact us at tours@inkas.com from any of your hotels. We don't want your experience to be diminished in any way. Don't hesitate to speak up if anything isn't as you wish. For example, if you aren't satisfied with your hotel room, request that your guide or representative ask for another one. If you want more time in one place and less time in another or more downtime in general, tell your guide. Likewise, inquire about any change in the itinerary from what you were expecting. If your guide can't solve the problem, please contact your representative or Inka's Empire Tours as soon as possible. Later on, it may be too late. Our goal is to provide all of the services promised in your itinerary and to avoid any disruption of your tranquility and enjoyment. Despite our best efforts, a glitch could occur because of mechanical failure or human error. Generally, any problem is corrected quickly by our guides or representatives. In the rare case that it is most easily corrected "on-the-spot" by you, we authorize you to expend the necessary sums, and we will reimburse you upon your return. A passport valid for at least six months after your entry date and proof of onward passage are required. To enter Peru, Ecuador or Chile, citizens of the United States, the European Union, Canada and Australia do not need a visa. Citizens of other countries should check with the nearest consulate of each country they intend to visit. Chile. Visitors from some countries must pay a reciprocity fee upon arrival at the Santiago airport, currently $140 for U.S. citizens, $61 for Australians and $132 for Canadians. Payment can be made in U.S. currency or by credit card. Visitors from the United Kingdom and New Zealand do not pay a fee. Citizens of other countries should check with the nearest Chilean consulate. All visitors must fill out a tourist card, a short form provided on your flight into each country. Keep your copy and present it to authorities upon departure. To apply for a U.S. passport, contact your local passport office, designated court clerks or selected post offices. For detailed information about passport and visa requirements, visit one of the above or the U.S. State Department web site. "The general information in the travel books about our neighbors to the south, coupled with State Department Bulletins, CDC warnings, and general gossip, would easily convince you that you should never stray from your living room. For the very intrepid, maybe south Florida -- but South America? We were warned about nefarious taxi drivers, malaria, pickpockets, yellow fever, the Shining Path, drug smugglers, corrupt police, 27 types of gastrointestinal disorders, dangerous roads, rickety buses, high winds, lost luggage, medical evacuations, rabid dogs, and tropical diseases with unpronounceable names. What we found instead was a beautiful and incredibly varied country; warm, friendly and highly industrious people who were very solicitous of tourists; buses, trains and planes that ran precisely on time; delicious food (and drinks), frequently accompanied by spirited music and dancing; exotic wildlife; a system of terracing and hydraulic engineering that is unequalled in the world; and a fascinating cultural and political history that reaches back for thousands of years." Consult the U.S. State Department for any Current Travel Warnings. It is important to prevent mosquito bites by wearing long-sleeved shirts and long pants. In addition, apply an insect repellent that contains 30% to 35% DEET to exposed skin. If you prefer a natural repellent, one possibility is TheraNeem Leaf & Oil Herbal Outdoor Spray by Organix South, Inc. We further recommend a cap or a hat with mosquito netting to keep insects away from your face. Such items are available at outfitters and should be purchased before leaving home. Peru currently does not require a yellow fever vaccination, but the lodges advise it, especially during the rainy season (November through April), when there are more insects. The vaccination is valid for 10 years and must be administered at least 10 days before you arrive in the rainforest. Ecuador does not require a vaccination and the lodges do not advise it. For definitive advice, consult with your physician or a specialist in tropical medicine. Malaria is only a concern for travel to the jungle areas, and there is no official requirement for preventive treatment. In Peru, the lodges state that their guides and staff do not take anti-malarial medication and that there are no recorded cases of malaria in their areas. Therefore, they do not advise treatment. However, the lodges in Ecuador do. Again, consult with your physician or a specialist in tropical medicine for definitive advice. Further health information for travelers to South America is available from the Centers for Disease Control. Take an ample supply of your medications with you and your doctor's prescription for each, in case you need refills. On arrival in Andean cities, which are at elevations of 11,000 to 12,000 feet above sea level, your body must adapt to the lesser amount of oxygen. During the first day or two, avoid strenuous activity and alcohol. Eat lightly but drink plenty of non-alcoholic liquids, including "mate de coca" (fresh coca-leaf tea). Most visitors are only mildly affected. Symptoms are an insignificant headache that disappears with one to two ordinary painkillers, nausea and general malaise, or slight dizziness. If only mildly affected, you can continue on your excursions. However, a small number of visitors are affected severely. Symptoms may be an intense, enduring headache that is not cured by a couple of ordinary painkillers; marked nausea and repeated vomiting; irritating dizziness or actual difficulty with balance and direction; regular visual disturbances with flickering vision and problems judging distance; pressure in the chest, rapid breathing and pulse rate, crackles in breathing and shortness of breath; swelling beneath the skin, typically around the eyes and in some cases swollen ankles and hands; confusion; or convulsions. If you experience any of these symptoms, ask your guide to give you emergency oxygen and take you to the lower elevation of the Sacred Valley, where your hotel is located. If symptoms persist, seek immediate medical attention. If you have reason to believe you are or may be susceptible to altitude sickness, it is important to consult your physician about Diamox and Paracetamol. We protect our guests by providing an emergency cannister of oxygen in our vehicles during every excursion at high altitude. Additionally, our guides have been trained to recognize the symptoms of altitude sickness and properly administer the oxygen, if needed. For details, see Avoiding Altitude Sickness. The sun can be intense at high elevation and near the equator. Watch out for sunburn: use High Protection Factor (HPF) sunscreen. Cipro, a prescription medication, is recommended in case of traveler's diarrhea, as is NSF, an extract from the sap of the Croton lechleri tree that has been used for centuries by shamans, or traditional healers, in the Amazon Rainforest. However, if you adhere to our food and drink advice, you should avoid any problem. Our hotels and restaurants take great care in preparing their food and drinks. Fresh fruits and vegetables are safe to eat, even if unpeeled. The water served is either bottled or purified, and you may drink it, including ice cubes, without risk. In any of our hotels and restaurants, you can confidently eat and drink anything they serve. Outside our hotels and restaurants, avoid fresh fruits and vegetables unless you peel them yourself, water that is not bottled or purified, and ice cubes. Never drink tap water, anywhere. In Lima, never eat food from street vendors; however, in other areas it is relatively safe to do so. We request a copy of your international flight itinerary, including the record locator number. This "number" is a code assigned by the airline to uniquely identify your reservation. It usually consists of six letters or a combination of six letters and numbers. Passengers of Continental Airlines should also provide their ticket numbers. We need this information to verify that you are actually aboard the plane and to reconfirm your international departure. If not reconfirmed 72 hours in advance, the airline could cancel your reservation. Be sure to advise us of any changes in your flight schedule. Allow two hours prior to flight time for an international departure from the U.S. or South America (for example, a direct flight from New York to Lima or from Lima to New York). If the first segment of your flight is not international (for example, New York to Miami), allow 90 minutes, except within Peru, Ecuador or Chile, where one hour will be adequate. Assume that whatever security restrictions exist in the U.S. and Europe will exist in South America. Consult the Transportation Security Administration (TSA) web site for current regulations. Except in rare circumstances, we use LAN Airlines S.A. (operating as Lan Peru and Lan Chile), South America's safest and most reliable airline. This carrier has the newest planes (Airbus 320s) and the best maintenance. Within Peru, Ecuador and Chile, there is only one class of service except for the LAN flight from Santiago, Chile, to Easter Island and return, which offers First Class. Since weather conditions in the Andes can sometimes prevent scheduled takeoffs and landings, we book our guests on early flights to minimize the chance of an overnight delay. The U.S. Federal Aviation Administration (FAA) has assessed the governments of Peru, Ecuador and Chile as being in compliance with ICAO international aviation safety standards for oversight of their country's air carrier operations. Additionally, the Aviation Safety Network database shows no safety occurrences for Lan Peru and none since 1991 for Lan Chile. Since LAN does not operate between mainland Ecuador and the Galapagos Islands, we use Aerogal (Aerolineas Galapagos) or Icaro. Aerogal had one safety occurrence in 1997. There were no fatalities. Icaro had one safety occurrence in 2005. Again, without fatalities. Peru: Any airport departure taxes not included in your ticket is paid for by Inka's. Ecuador: Domestic and international airport departure taxes are included in your tickets. Chile: $30 for international flights, $8 for flights within Chile. Note that the free baggage allowances are per person. We recommend that each person take one carry-on bag (not exceeding the maximum size and weight shown below), one or two checked bags (not exceeding the maximum size and weight shown below) and a day pack for the excursions. This variety of baggage will allow for the flexibility in packing needed to make travel to Machu Picchu and the Amazon Rainforest the most convenient. Excess baggage charges will be assessed by the airline for items that exceed the number, size or weight of the free allowance. The excess weight charge is $3.97 per lb/$1.80 per kg plus applicable taxes. Other airlines may have different allowances and excess baggage charges. Please check with your carrier. LAN, our usual carrier in Peru, Ecuador and Chile, has the following free baggage allowance on national flights. However, if your international flights are also on LAN, you will receive the greater international allowance. Excess baggage charges will be assessed by the airline for items that exceed the number, size or weight of the free allowance. The excess weight charge is $3.97 per lb/$1.80 per kg plus applicable taxes (19% in Peru). On the train to Machu Picchu, PeruRail allows only one carry-on bag, as specified below. Note that the maximum weight is significantly less than that allowed by the airlines. We will take care of the rest of your baggage until your return to Cuzco. Upon your morning arrival at the hotel, you will be able to check in immediately and use your room. Check-out time on the following day is early -- 9 am -- but you can store any items you wish at the reception desk and use the hotel's facilities until you leave for the train station in the afternoon. After your international arrival at the airport, pass through immigration, baggage claim and customs. Upon leaving customs, look for your guide, who will be bearing a sign with your name. You will then join the chauffeur for the drive to your hotel. During the trip, your guide will provide your travel vouchers, brief you on the area and review your excursion for the following day. Upon your international departure (we will reconfirm your flights and advise you when to be ready), your chauffeur will take you to the airport and your guide will help you check-in. The procedure for destinations within each country is similar but easier, since the immigration and customs inspections occur only for international flights. Passengers are required to pay the airport tax in cash prior to departure. Although we have never failed to meet a guest, we do have a contingency plan. If you are unable to locate our representative within 15 minutes of your scheduled arrival time (flights sometimes arrive early), please take a taxi to your hotel, check in and ask the receptionist to notify our local office of your arrival (your hotel's name and our emergency phone numbers appear near the top of your Tour Itinerary). To get the taxi, ask any airport employee to help you locate a certified service before you leave the building. The fare ought to be agreed upon in advance with the driver and for two people should not exceed $25 in Lima, $10 in Quito or $25 in Santiago. Tipping isn't customary. We will reimburse you upon your return. Each geographical zone in Peru and Ecuador has its own climate. Because the countries are close to the equator, the temperatures within each zone vary little over the course of the year; however, the rainfall can vary significantly. April through November is the recommended time to visit. In all seasons, the temperature during the day varies from 68 to 77 degrees F (20 to 25 degrees C). The temperature at night in April through November is cold, often below freezing; but in December through March, it is warmer, about 59 degrees F (15 degrees C). There are sporadic, heavy rains from January through March, dry weather from April through November, and occasional rains in December. The climate along the coast is always mild, with a moderate temperature and little rain. Summer: January through March. The temperature during the day ranges from 77 to 84 degrees F (25 to 29 degrees C) and at night is about 59 degrees F (15 degrees C). Autumn: April through June. The temperature during the day ranges from 66 to 75 degrees F (19 to 24 degrees C) and at night is about 57 degrees F (14 degrees C). Winter: July through September. The temperature during the day ranges from 55 to 66 degrees F (13 to 19 degrees C) and at night is about 55 degrees F (13 degrees C). You will need a sweater and a medium-weight jacket. Spring: October through December. The temperature is the same as in Autumn. The Amazon Rainforest is hot. The temperature during the day varies from 86 to 95 degrees F (30 to 35 degrees C) and at night is about 72 degrees F (22 degrees C). The dry season is from May through October, but it rains in brief showers at any time of year. Avoid the rainy season from November through April. It is hot and humid, with heavy rainfall. In contrast to the equatorial countries of Peru and Ecuador, Chile is uncomplicated: the season is September through March, corresponding to spring and summer weather in the northern hemisphere. Casual clothing, including T-shirts, jeans and sports shoes, will be the most comfortable and suitable for your tour. Nobody wears a coat at any time of year. A sweater and a medium-weight jacket are sufficient, even at night in the Andes. However, dressing up is customary but not obligatory when going to a fancy restaurant. For men, we recommend a long or short-sleeved dress shirt, dress pants (anything but jeans) and dress shoes. A coat and tie are not necessary. Women usually wear pants and a blouse, a dress or a suit, accompanied by dress shoes, makeup and jewelry. For advice about clothing on ecological tours, see our Inca Trail and Galapagos Islands Pre-Departure Information. The nuevo sol (S/) is the Peruvian currency. Currently about three nuevo soles are equal to one U.S. dollar. Ecuador uses the dollar itself. Chile uses the Chilean peso (CP). Currently about 540 Chilean pesos are equal to one dollar. In the cities, you can use dollars to purchase anything and take the change in U.S. or local currency. The exception is buying textiles or other crafts in the countryside. Artisans may be able to accept only small-denomination bills of the local currency (equivalent to no more than $5 or $10). If you have reason to do so, you can change your dollars at the airport, in most banks and in casas de cambio (private money exchange offices), but the most competitive rates are offered by traders on the street, a fine example of the free market at work. Ask your guide for assistance in order to avoid the rare possibility of being cheated or given counterfeit bills. Start your tour with $30 per day per person. Use cash machines and credit cards to augment those funds as needed. You will be able to get cash with your bank or credit card at automated teller machines in cities throughout Peru. Look for machines that function with one of the electronic systems indicated on your card. Take out dollars to avoid your bank's currency conversion fees. Major credit cards are accepted by most restaurants, hotels and stores. The currency conversion fee charged by your credit card company will be high, but since you are on vacation, the convenience may be worth it. Avoid traveler's checks. While offering maximum security, they are costly and inconvenient to cash. Our suggestions are for two people, not per person. If one person, deduct 25%; if four people, add 50%. We recommend that any tip be given to your guide, chauffeur and representative at the end of your stay in each destination. Guides: $14 per full-day excursion or $7 per half-day excursion. Chauffeurs: $6 per full-day excursion or $3 per half-day excursion. Transfer representatives: A representative will accompany you on transfers to and from your hotels, restaurants and transportation terminals. Where that person is other than your guide, a total of $10 for all of the transfers at each destination except at Lake Titicaca, where our suggestion is $5. Transfer drivers: No tipping of transfer drivers unless the driver performs an additional service, such as taking your bags into the hotel (see below). Porters, room service, bartenders & chambermaids: $2 for minor personal service, such as carrying your bags at the airport or the hotel (any number of bags), room service (per delivery), bar service (any number of drinks) or chambermaid (per night). Waiters: In Peru, your guide will tip each waiter, so you need not do so. The exception is if you have opted out of our included dinners and are having dinners "on your own". In that case, consider a 10% gratuity. In Ecuador and Chile, where we do not tip the waiters, you may wish to give 10%. Suggestions are for two people. If four people, add 50%. We recommend that any tip be given on the last night of camping on the Inca Trail. Once the porters depart the next morning, you will not see them again. The personnel required are 1 guide, 1 chef, 1 chief porter and 2 porters per trekker. For example, the personnel required for two trekkers are 7: 1 guide, 1 chef, 1 chief porter and 4 porters. Any tip may be given to the guide for distribution or, if you prefer, you may give any tip to each individual personally. *Since the chef, chief porter and porters live in the surrounding countryside, it is more convenient for them to receive Nuevo Soles (S/) instead of U.S. dollars. Suggestions are for two people. If four people, add 50%. Guide: $12 per day on the final day. For the rest of the staff, such as the boat's pilot, crew, bellboy, waiter, cook and others: a total of $20 (not per day) may be deposited in the dining room's tip box at the end of your stay. Monthly, these gratuities are divided among the workers based on the quality of their service as rated by guests. If you prefer, you may give any tip to each individual personally. Suggestions are for two people. If four people, add 50%. Any tip should be given at the end of the cruise. Crew (including the chef): $20 per day. Some of our hotels provide spa services. A link to the spa is provided in our description of the hotels, which vary with your category of accommodation, either our Frugal Luxury, which provides small luxury inns, or our ultraluxurious De Luxe, Imperial and Royal Class categories, which provide Orient-Express hotels. In case a spa is not mentioned at any hotel, it is not available. Our hotels in Lima, Cuzco, the Sacred Valley, Puno, Arequipa, the Colca Canyon, Trujillo and Cajamarca provide a hair dryer in your room. The lodges of Machu Picchu, northern Peru (Tucume, Chachapoyas, Leymebamba) and the Amazon Rainforest do not. All of our hotels and Amazon lodges offer laundry service, with the exception of the Amazonia Lodge. If you provide the clothes to be washed in the morning, the hotels will have them ready that evening. However, in the Amazon lodges, inclement weather may cause a delay because clothes are dried in the sun. Our hotels in Lima, the Sacred Valley and Cuzco will bring an iron and ironing board to your room upon request. Each hotel also offers ironing service for a fee. The hotel at Machu Picchu does not provide an iron or ironing board, but does offer ironing service for a fee. Our hotel in Puno does not provide an iron or ironing board, but upon request will provide complimentary ironing service for one or two garments. For more than two pieces, there is a fee. The jungle lodges provide neither an iron, ironing board nor ironing service. Anyone trying to reach you may call your hotel during the evening or our local office during the day (the phone numbers are shown near the top of your tour itinerary). Our local office will convey any message to your guide. Miraflores Park by The Andean Experience Co.
All of the rooms have phones with an outside line. For calls to the United States, the following rates apply: $6.10 per minute for the 1st through 10th minute, $3.48 per minute for the 11th through 25th minute and $.85 per minute thereafter. A phone card that utilizes an 800 number can be used from your room. All of the rooms have phones that connect through the hotel switchboard to a satellite phone. For calls to the United States, the rate is $11.65 per minute. A phone card cannot be used at the hotel, but one that utilizes an 800 number can be used in the town of Aguas Calientes upon your train's arrival or immediately before its departure. All of the rooms have phones that connect through the hotel switchboard. For calls to the United States, the rate is $9.91 per minute. A phone card cannot be used from your room, but can be used at the public phone near the reception desk. The hotel offers wireless Internet access in all of the rooms at a rate of $20 per day. The Business Center is available for guest use at a rate of $10 per day. It has four PCs connected to the Internet, a printer and a fax. There is an additional per page fee for printing or faxing a document. The hotel offers complimentary wireless Internet access in all of the rooms. The climate in the Sacred Valley may affect the Internet signal. On rainy days, the signal may be slow or interrupted.There is no business center and no PCs are available for guest use. The hotel offers wireless Internet access in all of the rooms. The rate is $15 per day. There is no business center and no PCs are available for guest use. The hotel offers wireless Internet access in the Royal and Presidential Suites without additional cost. Access should be requested and confirmed at the time of booking. A less expensive option is to stay in a Junior Suite or De Luxe Room and use your computer at a table in the Lobby Bar at a rate of $10 per day. The Business Center has two small workstations, each with a PC. The first 30 minutes are free; afterward the charge is $3 per hour. A printer is available at a rate of 60 cents per black and white print and $3 per color print. A scanner is available at a rate of 60 cents per scan. The limited space is fine for checking your e-mail, but the Lobby Bar is more comfortable if you need to work. Titilaka by The Andean Experience Co. The hotel offers complimentary wireless Internet access in all of the rooms and a fully equipped business center with two computers and a printer for guest use. Our hotels and jungle lodges in Peru and Ecuador have American-standard electricity and outlets, as does your Galapagos yacht. * However, in the jungle lodges, electricity is available for only a few hours in the evening. Chile, which has 220-volt and 50-hertz electricity, may require a transformer and an adaptor. These are provided by the hotels. *The one exception is the Amazonia Lodge, which has only 220-volt and 60-hertz electricity. To operate certain electrical devices, it may be necessary to take a transformer and adaptor. The time in Peru and Ecuador is the same as Eastern Standard Time. In the Galapagos, it is one hour earlier and in Chile, it is one hour later, except during daylight savings time, when it is two hours later. Daylight savings time in Chile is from the second Saturday of October through the second Saturday of March, with changes at midnight. The metric system of weights and measures is used throughout South America. The most characteristic crafts of Peru are textiles, silver or gold jewelry, and ceramic vessels called "huacos". Peru's Endangered Species Act prohibits activities affecting threatened and endangered species unless authorized by a government permit. We strongly discourage the purchase of animal specimens, while traveling, as their legal and ethical collection cannot be verified. Illegal trade in animal specimens contributes to poaching and habitat destruction. If you'd like to take back souvenirs, we recommend textiles. They are especially fine in the Sacred Valley's pueblo of Chinchero and other villages. 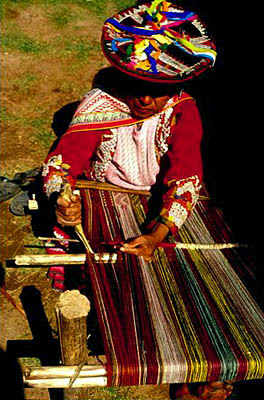 Traditional weaving is preserved, in part, through the efforts of The Center for Traditional Textiles of Cusco, which operates a gallery and museum in that city. See Descendants of the Incas for a photo essay on the weavers and weaving. For ceramics, visit artisan Juan Garboza's Taller de Ceramica Pre-Inca at Tanda Pata No. 676 in Cuzco. His studio is just above the fountain of the Plazoleta San Blas. Cuzco is famous for its artisans in wood, who create masterful frames and furniture in the Cuzqueña style, combining Baroque and indigenous elements. Perhaps the finest carver is Miguel Angel Leon at Cordova del Tucuman No. 372, near the Plaza de las Nazarenas. Others will be found in the San Blas artisans' quarter. When in San Blas, be sure to visit the Artesanias Mendivil at Plazoleta San Blas No. 619 to see the distinctive long-necked archangels by Pancho Mendivil Dueñas. Nearby are the religious art workshops of the Merida, Olave and Rojas families. The strategy for bartering is first to see everything and compare prices. If you find something that appeals to you, don't show any special interest. Often, as you leave to look further, the seller will offer you a lower price. However, not everyone has the same style, and you may need to return later and make an offer. If the asking price is similar to others, you might start by offering two-thirds of that amount, with the goal of paying three-quarters. After concluding the barter, feel free to praise the beauty and quality of the work -- its creator is probably the same person who is selling it to you! Be aware that most silver, gold and ceramic objects are not handmade, in which case you may be able to negotiate a greater discount. One of the finest crafts shops in Peru is Mari Solari's Las Pallas in the Barranco district (Calle Cajamarca 212, Barranco, Lima, Tel: 477-4629. Another souvenir that will provide memories of your tour in Peru and lasting pleasure is music. There are two main types: huayno -- folkloric music of the Andes -- and criollo -- music of the coast. Criollo is strongly influenced by the Spaniards and comprises three distinct styles: the spirited marinera, the sentimental waltz and the Afro-Peruvian, that of the black slaves during the colonial period. We recommend that you concentrate on the huaynos. The Discocesa label offers excellent albums -- look for the superb Apra Andina as interpreted by harpist Luciano Quispe -- it's a treasure. Another magnificent work is Musica Cusqueña by the Amanecer Andino group. From the same label is Lo mejor de musica Inca. The Ninsa label offers Peru Folklorico, Volumes 1 and 2, both excellent compilations of the classics. You will soon recognize beloved songs, like Virgenes del Sol, El Condor Pasa and Adios Pueblo de Ayacucho. If time is short, ask the shopkeeper for advice. Your small investment is likely to be richly rewarded! The Royal Commentaries of the Inca, Garcilaso de la Vega, 1609. The History of the Conquest of Peru, William H. Prescott, 1847. Lost City of the Incas: The Story of Machu Picchu and its Builders, Hiram Bingham, 1948. Machu Picchu, Poems by Pablo Neruda, Translation by Stephen Kessler, Photographs by Barry Brukoff, Prologue by Isabel Allende, 2001. Talking Knots of the Inka, Viviano Domenici and Davide Domenici, Archaeology, Volume 49 Number 6, November/December 1996. 'Lost City' Yielding Its Secrets, John Noble Wilford, The New York Times, March 18, 2003. Winter Palace, Fergus M. Bordewich, Smithsonian, March 2003.